Are Used Tires Your Best Option? Used tires may initially cost you less, but they may not be a practical, long-term solution. HomeTowne Auto Repair and Tire believes in using products that will save you money in the long run, and keep you and those you love safe. 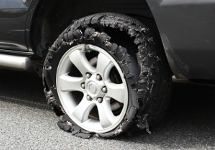 While the tires may look new on the outside, this may not always be the case. This is because some used tire dealers paint the tires black, giving them a new, showroom appearance. However, over time, the rubber on the inside of the tire gradually deteriorates causing your vehicle to become unsafe, increasing the risk of a blowout. This has prompted tire and car manufacturers alike to issue warnings against using tires beyond six years of age, even if they have never been used. The sale of used tires is greatly lacking in regulations and quality control guidelines. These tires are often retrieved from salvage yards, and thus, are not being stored properly. Storage environments are a key element that may cause a tire to become unsafe. Tires should not be left in conditions that are wet or humid, in direct sunlight, or directly on asphalt. All of these elements can cause tires to weaken and severely affect their integrity. Furthermore, you may not be able to tell if the tire had been run flat, or if there is any impact damage to the steel belts which would structurally weaken the tire. Lastly, most used tires do not come with a warranty, so if a problem does arise, you don't have any recourse. New tires generally come with a warranty to protect consumers in the event of a faulty tire, or a manufacturer recall.